No, I am not about to break out in song. 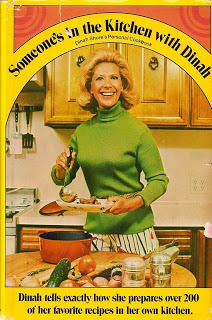 This is actually the title of Dinah Shore’s delightful cookbook, “Someone’s in the Kitchen with Dinah,” published in 1971. Some of us may remember her Chevy commercials (See the USA in your Chevrolet!) or some may recall her love affair with Burt Reynolds, who was 20 years her junior. I remember both, but enjoy her cooking more. 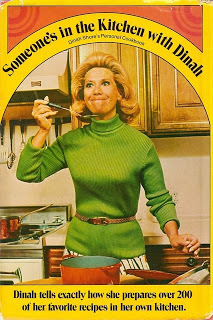 The first line in her cookbook is “I have been collecting and trying recipes ever since I can remember,” a statement that will capture my attention right away. It means the book probably offers lots of old family recipes, which it does, but since she lived in LaLa land with lots of celebrities, we will be able to see what’s in their kitchens, too. The recipes in the cookbook are all tried and true favorites. There are many recipes from her upbringing in Tennessee, including Cousin Selma’s Pancakes, Mother’s Chili Con Carne, Mother’s Chicken Salad, and Mother’s Pecan Rum Cakes. In the true spirit of her country roots, Dinah once threw a party where she told guests to dress in overalls and straw hats. The buffet table included the addition of “blue ribbons” on the dishes in county fair style. She had red-checkered tablecloths, watermelons, magnolia branches as centerpieces, candles in tin cups, jugs, fried chicken, biscuits, and mashed potatoes, all enjoyed with country music in the background. It is worth tracking down this book just to get Bill Holden’s steak marinade. It is my (and Dinah’s) favorite ! Thank you for the tip, Scott! I am going to try the marinade. Did you know Dinah? Lucky you, if you did. I always admired her so, and love her recipes. Lisa, I’m so sorry for the loss of your mom. Yes, my mom will be celebrating her 97th birthday in August. I am so lucky to still have her, but she lives in California with my oldest brother and I miss her every day.